One proud elderly lady on the road, her smile would disappear when I pointed the camera. 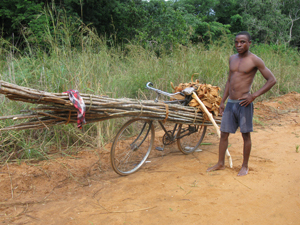 Overloaded bicycles were the workhorses in Mozambique. 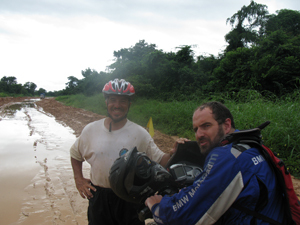 Two South African motorcyclists shared my grief on the muddy section in Tanzania. This is Claudio. I began my ride on May 14 from near Monapo in Mozambique on the dirt road leading north from Angoche. Michael Smewing was kind to help me that day, delivering me from Nacala to the starting point. From Monapo I continued west to Namialo then I turned north to Mozambique's less developed Cabo Delgado district. My thought was to ride past Mueda to Nagomane where a new bridge over the Rovuma River had been built. The bridge was located about 200 km inland meaning a huge detour for me. 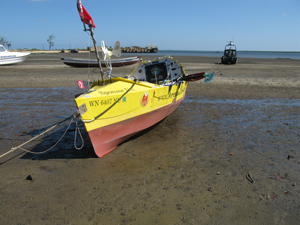 The alternative was to head for the coast to Moçimboa da Praia then north from there. In the latter case the river crossing would be by a dugout canoe or a boat -- whatever was available. I found survival on Mozambique roads to be difficult for a lone rider. Food for sustenance was a problem. People were farmers with roadside mudhuts and gardens in between. Their one story homes were strung out along the road requiring long walks to the small market towns. Even before dawn, men and women lined up on either side of the road, balancing big bags, firewood, a bucket of water or groceries, or a simple machete on top of their heads. Women in addition were typically carrying a baby tied in a triangular cloth in the small of their backs. The market towns would be busy in the cooler morning hours but it was impossible for me to enter these with my rig. The service industry was practically nonexistent; a restaurant was a foreign concept in a country where there was hardly any cash to go around. I considered myself lucky if I found some papaya or lime for sale on the curb. Small grubby wooden shacks were set up as stores in villages, selling bottled water, soda drinks, stale crackers and cigarettes. Power was rare; without power, there was no refrigeration. I was more likely to find a bottle of soda than water, which served as a cheap energy drink with sugar and caffeine. 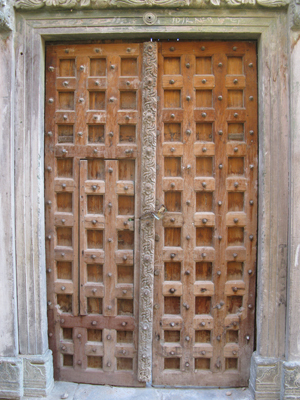 Larger settlements had a small substandard hotel called a pençao typically with no running water. I'd rinse out of a bucket with a ladle. In such places I avoided the toilet also and I preferred to postpone my morning toilet business for the road. Life for children going to school was no easier. They walked great distances on bad food, very likely got questionable food at school then left their books and notebooks behind before walking back to a dark mudhut which was their home. No homework could be assigned; no reinforcements in learning were possible. How could a nation get ahead with such handicaps in basic education? The local technology for home construction didn't allow multi story buildings; concentration of the population for services was not possible. The thought of bringing power, water and sewer to each respective hut was a nonstarter in such a poor country. Schools were just a different manifestation of this same problem; boarding schools could be a solution... this was urban sprawl at its opposite extreme. The local information that I got in Macomia about presence of lions, leopards, hyenas and elephants west of Mueda worried me. When it became clear that the 150 km road from Mueda to Nagomane would be a sand track, my decision to avoid that detour was final. From late morning until mid-afternoon the sun gets especially hot in these latitudes. I suffered greatly when I walked the uphills without any air moving past me. North of Macomia, sandy road construction with frequent changes in consistency caused crashes, bloodied my knees and elbows, and forced me to walk my bicycle. The road beyond Palma had been shown as a secondary road on the map; but in reality, it was just a sandtrack beat down by 4x4 vehicles. Soft white sand underfoot could have been perfect at any beach, but was a disaster with my rig. The small wheel of the trailer tended to dig a trench rather than roll; when I pushed the handlebar to move the rig, the front wheel would dig in, my shoes would fill with sand. The physics of it was absolutely brutal under the sun; I pushed, pulled, fought and wrestled that rig all day for days. Crossing the Rovuma River on Sunday May 22nd proved fairly swift except for my incompetence in the gondolier style use of a long wooden pole against the shallow bottom. I paid money to the boat owner then had him sit and direct me. I had to push the pole straight back but tended to turn the wooden dory with each push. Eventually I managed to put the bow on a sand bank despite warnings from the two boat owners. It was low tide. I stepped overboard to thigh deep water, helped shove the bow into deeper water then continued walking along the sand bar and across the shallows to the other side; I let the experts bring the boat around. The crossing took about 45 minutes, we unloaded my rig then I rolled north on firmer dirt surface in Tanzania. I checked into a hotel in Mtwara that night which happened to have an open air joint next door with live loud music with a throbbing base which did not stop until one o'clock. In contrast just the night before, I had camped about 15 km short of the river on the Mozambique side, about 100 meters back from the sandtrack. In the morning I found huge elephant foot prints on the sandtrack; it had walked south along the road so close to my tent. Thursday May 26th was a day when I thought I could actually fail. 24 hours of nonstop heavy rain turned a 60 km stretch of road construction into ankle deep mud and knee deep slurry in tire ruts. My despair grew for about 20 km of this muck on the service road; fortunately after that I was able to get on the unfinished main road. Tree trunks and sand berms were laid on this to keep traffic off during construction but I could navigate around them. Such a welcome break restored my mood and I continued on “my private road” the rest of the way without a single vehicle to bother me. From Daressalaam, I will continue on toward Arusha where I will visit the Mateves Secondary School for which Around-n-Over will be fundraising throughout my stay in Africa. We are working with Mountain Madness and our local partner African Environments to oversee the construction of 20 additional classrooms. We need your help in spreading the word for this specific cause and we will apply your donations directly to the same until my launch on the South Atlantic in mid-September. The Mateves Secondary School has grown from no classrooms to just ten since 2006, while its number of students has blossomed to 1,200. This number should increase to 1,600 with new enrollments. To improve the quality of education at this school for existing students and to accommodate additional students, more classrooms have to be built. By tripling the current number of classrooms, the student-teacher interaction will be improved. The goal is to have 50 students per classroom in this school. Participants of the upcoming Kilimanjaro climb in June will be actively fundraising for Mateves through the 2011 tax year. I will be encouraging donations for this cause from now until I launch on the South Atlantic from Namibia, during the time that I dedicate to cross Africa by human power. We hope that you will be equally excited to donate, to spread the word, to invite friends and to locate additional resources for us to help the Mateves Secondary School. NOTE: Stage 3 summarizes my effort since Mt Kosciuszko. I have also updated the Google Earth track until Daressalaam. 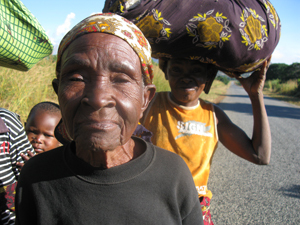 I am posting a dispatch on behalf of Erden who has not had internet access since arrival in Angoche, Mozambique. You all must be wondering if he made it.